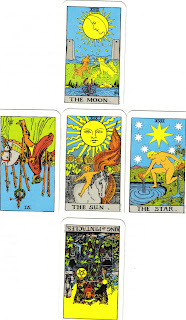 Since yesterday marked the Summer Solstice, I thought it might be interesting to show you a great tarot spread called, "Bodran's Summer Solstice Tarot Spread." I've provided a copy of the spread here, but you can check out this link for more information. 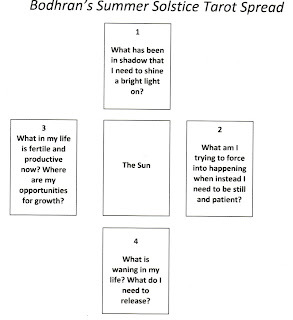 I used this tarot spread with my Intuition Through Tarot class last week in preparation for the Summer Solstice and they all loved it. Pull "The Sun" from the deck and place it face up in the center. During the Summer Solstice, the longest day of the year, more light is available to us. What in my life has been in shadow that I need to shine a bright light on so I can see it clearly for what it is? The word "solstice" comes from the Latin "sol" (meaning sun) and "sistere" (meaning to cause to stand still). What in my life am I trying to force into happening when instead I need to be still and patient? The Summer Solstice is often called "Midsummer" because it is roughly in the middle of the growing season. What in my life is fertile and productive now? Where are my opportunities for growth? After Summer Solstice, the days gradually become shorter, and the sun's strength wanes as winter approaches. What is waning in my life? What do I need to release? The Moon -- What do I need to shine a light on to see it more clearly? My intuition and the intuitive work that I do. 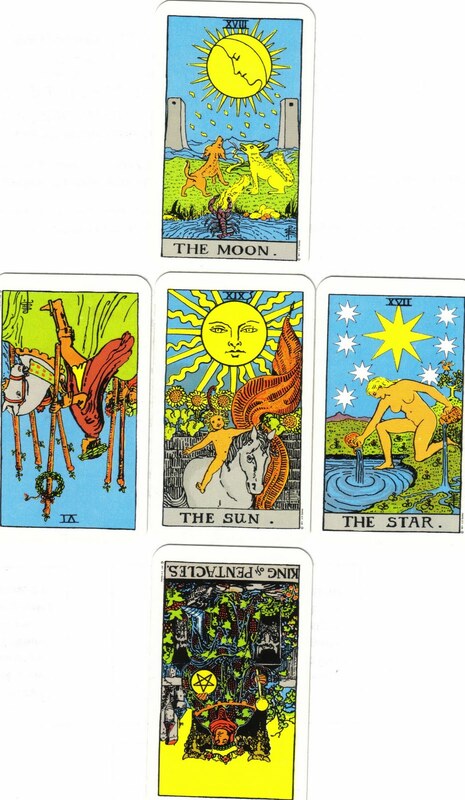 The Star -- Be patient as your intuitive gifts continue to unfold. New gifts are yours when you are ready to receive. Six of Wands (reversed) -- Give up earthly forms of success and concentrate on your spiritual work. Release competitiveness. King of Coins/Pentacles (reversed) -- Let go. Do and be what you have been called to do. Flow. Stand firm in what you know. 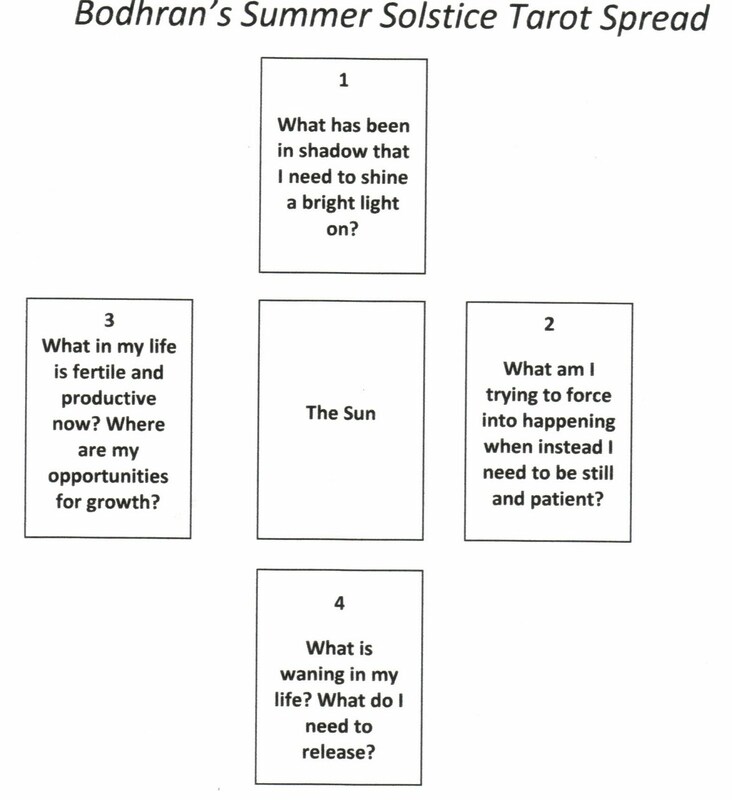 If you have a deck of tarot cards, shuffle and ask the question, "Tell me what I need to know about the energy surrounding the Summer Solstice" and see what comes up for you. As for me, it could make for an interesting summer (and beyond)!!! What an awesome spread! Love it! It will be very exciting to see where you go as the summer wanes into the equinox and then in to winter.